Women are apparently turning to target-shooting in increasing numbers. And some say they find the experience calming. CBS evinces unnecessary surprise at the fact that women — even those who might enjoy such practices as wearing skirts and rearing children — can also shoot guns. Shooting instructor Lesa Ellanson sets them straight: "I think a capable woman is the most feminine expression of power that there is." There's nothing surprising about a lady with a firearm, but there is something kind of surprising about Deirdre Gailey's statement: "I'm a yoga instructor, I work at a vegan bakery — and I also like to shoot guns." Gailey explains that "yoga's Zen-like quality can be applied to shooting guns in a lot of ways. 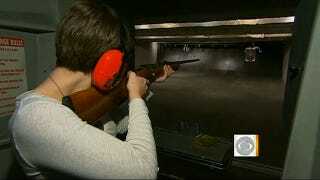 Shooting guns takes focus, concentration, and it doesn't always have to be about violence." Ellanson also says the sport makes her feel "relaxed." That's not the word I'd necessarily use to describe practicing with an extremely loud and deadly weapon. Then again, maybe it makes sense that women are trading in their yoga mats for firearms. It's about to be 2012, after all, and during the apocalypse, a downward dog will not protect you.